S4GRU has been on a bit of a roll of late. We had an unusually quiet summer here on The Wall, as our writing staff was frequently away on summer vacation. But we have come back with a vengeance. All three of those articles were "Teasers." We have decided to publish shorter articles more often when longer articles may not be immediately feasible for our writing staff. Then, down the road, expect more in depth follow up pieces, such as on the Nexus 5, iPhone 5S/5C, and Galaxy Mega 6.3. Today, though, we bring you another full length FCC OET airlink article on the presumed Sprint variant Samsung Galaxy Note 3. Late on Wednesday last week, authorizations for multiple Samsung Galaxy Note 3 variants -- all bearing the SM-N900 base numbering scheme -- started appearing in the FCC OET database. Other tech outlets had previously gotten a list of the model numbers and tied the N900A to AT&T, N900T to T-Mobile, N900V to VZW, and N900S to Sprint. But while the "A," "T," and "V" variants all arrived in the FCC OET, the "S" variant did not make an appearance, and additional info suggested that the "S" variant is instead for SK Telecom in South Korea. Meanwhile, the N900R4, the "R4" variant, also had its authorizations posted to the FCC OET. And at least one tech site incorrectly pegged it as the one for Sprint and other CDMA2000 operators. But that clearly missed the absence of band class 10 CDMA1X 800, which has been a staple of Sprint devices for roughly two years now. In the end, the "R4" variant is coming to CDMA2000 operators, but USCC and C Spire are the likely destinations. By now, many of our readers have a solid understanding of how to analyze the bullet points listed above. As such, we will hit just some of the highlights. Samsung has finally started adding LTE 10 MHz FDD carrier bandwidth authorization to its Sprint devices. That may be inconsequential during the lifetime of these devices, but it is nice to see, nonetheless, as other OEMs have included 10 MHz FDD capability from the beginning. The Note 3 is reportedly another world phone for Sprint. While the specs for FCC testing include only those bands licensed in the US, the GSM 850/1900 capabilities are actually quad band: GSM 850/900/1800/1900. Likewise, W-CDMA 850/1900 expands to include bands 1 and 8 for W-CDMA 2100+1900/900 outside of the US. 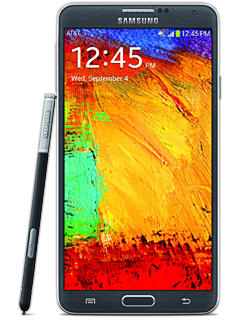 The Note 3 also follows the trend of devices released this summer that now support mobile hotspot via 5 GHz Wi-Fi. That can be handy in congested 2.4 GHz Wi-Fi environments, and congested 2.4 GHz Wi-Fi environments are now basically everywhere that people live and work. Devices with SMR 800 MHz capability seem to be coming through the FCC OET now with only conducted power testing, instead of radiated power testing. I suspected previously that a Class II Permissive Change would be required to include ERP testing, but that seems no longer to be the case. Looking back at the Sprint variant Samsung Galaxy S4 authorization docs, they submitted only conducted power specs for CDMA1X 800. Of course, the Galaxy S4 has already been out in the world all summer. I am not sure what to make of this, but Part 90 -- which governs SMR 800 MHz -- may not require ERP testing. So, going forward, we will report conducted power if that is the only data available. But the phrase that dare not be heard among the committed is "single band." One LTE band. That is the elephant in the room in this article. Yes, the "P" variant is band 25 LTE 1900 only. Sources have suggested to S4GRU that tri band LTE handsets headed to Sprint will not support SVLTE. As such, some have hypothesized that Sprint sacrificed tri band capability for SVLTE support in the Note 3 because it is, indeed, a "phablet." Using a "phablet" as a phone against one's ear looks clownish, so using the "phablet" in hand with an earpiece or Bluetooth headset may be expected, leading to more SVLTE usage. However, further examination of FCC OET docs on the multiple Note 3 variants and subsequently announced Sprint version Samsung Galaxy Mega 6.3 tri band "phablet" pokes some holes in that SVLTE theory. The major revelation, which will bring no solace to Sprint subs who had been expecting and are now pining for a Sprint tri band Note 3, though, is that the "R4" version headed to USCC manages to support both SVLTE and quad band LTE: band 4, 5, 12, 25 LTE 2100+1700/850/700/1900. The big takeaway is that Samsung has managed to cram in SVLTE and multi band LTE for relatively minor regional CDMA2000 operators. Why not Sprint? Well, the Sprint variant Note 3 is a world phone, while the regional CDMA2000 operator variant is not. And the Sprint version has to support band class 10 CDMA1X 800 and band 25 LTE 1900 -- unlike any others. Does the engineering required for world phone and Sprint boutique band/class capabilities present an obstacle to multi band LTE? Is SVLTE worth the sacrifice? I personally don't care about world phone support. I would much rather have a triband LTE device with SVLTE vs. triband LTE device with world frequency band support. If I use my phone internationally, I am just using wifi calling using apps like Viber or GrooveIP. If Sprint is able to find a way to do triband LTE support with SVLTE minus the world frequency band support, it should aim to do that. I think the only answer to get with the information we've been given is that the problem isn't multiple LTE bands, it's FDD and TDD being together on the same phone. Nice piece AJ, I'll skip the note 3 & the possibility for SVLTE in exchange for Triband Support. Great write up! Is there any chance this variant is for smaller regional carriers who have roaming with sprint? Perhaps another variant will be released for sprint at a later date? It's a long shot I know!! No. The "R4" variant that I also detail for its multi band and SVLTE capabilities is destined for regional operators that have roaming agreements with Sprint. Ah, then this is indeed a missed opportunity. I would have happily paid an extra $50 for it to have triband and waited an extra month or two if it had been an issue with delays (assuming Sprint communicated the timescale now). One thing Sprint really needs is 800mhz lte and voice, especially on a device like this (at least in my market). My commiserations to Sprint's pooch! i want triband support... but then again im in phoenix id be happy with just any band support (yes i know its coming im being facetious) so on one hand id love triband but realistically when am i going to get support for it... and i really want the note 3 lol damn you sprint why can you give me world phablet and triband.. I have the tp2, you could always just use it as a wireless router (for another smartphone) + dumbphone. I have taken this approach. It isn't the fastest phone but it is more than capable as a router and there are freeware apps to do this. I respectfully disagree. Wi-Fi is not nearly ubiquitous enough to rely on exclusively for mobile calls and data. International roaming rates also remain outrageously high, especially for data. Now that Sprint is finally moving in the right direction with GSM and removable SIMs, now is not the time to take that step back. Give them a few more months and, with enough money and determination, I'm sure Samsung could cram in tri-band CDMA/LTE along with quad-band GSM/W-CDMA and maintain SVLTE support. Besides, I think all signs point to TDD being the issue, not the GSM radio. Tri-band LTE or bust. I am not going to bother buying another phone on sprint that doesn't have tri-band LTE. If you don't have that, there's no way to take full advantage of the awesome network capabilities that are coming down the road. Thanks, but come on "world phone" and "out in middle of nowhere" support that several here on this board want are unimportant for 90+% of Sprint subscribers. In building support in urban areas where Sprint actually makes money based on subscriber density should have been #1. Let's be honest who the f*** cares if you don't even get voice coverage in rural areas? like in the middle of nowhere like 30-40 miles from Vegas strip, 50 miles from downtown Chicago, 25 miles outside downtown Phoenix (if that exists) etc, (be nice but get in building coverage in normal areas). Also interstate coverage in nowhere places would be nice but expendable versus 800 LTE indoor support. You know as well as I do that the reason Sprint "tri-band" devices can't support it is because LTE TDD bands require a separate antenna output from LTE FDD. All "tri-band" devices have dual-mode LTE. They support all of them with one path, but because LTE TDD differs substantially in air interface design from LTE FDD (obviously), it has its own antenna block on devices. That means that the antenna block previously reserved for CDMA2000 has to be replaced with LTE TDD. That's why SV-LTE cannot be enabled on Sprint "tri-band" devices. The R4 model can support it because LTE TDD isn't on the device. That extra antenna block can be used for CDMA2000 instead. You know as well as I do that the reason Sprint "tri-band" devices can't support it is because LTE TDD bands require a separate antenna output from LTE FDD. That is the supposition, but we are not taking just your word as the definitive answer on the matter because you are merely conveying info from a non definitive source. Dual mode FDD/TDD LTE can be done with SVLTE. Will it be done? Probably not. You miss the point, Neal. The "R4" variant provides the multi band LTE capabilities that most of our readers wish for in the "P" variant. Many would be happy with dual band 25, 26 LTE 1900/800 with SVLTE, and that would have been perfectly feasible in the "P" variant. That at least one regional operator gets those features while a major player does not is controversial. And, well, controversy makes for good reading, good discussion. I would settle for even Dual Band LTE at this point considering it will take just as much (if not more) time to have ubiquitous 2.5ghz TD-LTE coverage. Just to make sure I am reading the report correctly. The note 3 is not tri-band or even dual-band? It is only single band 25 1900mhz? Thanks AJ. I know many appreciate your investgative skills. I hear a few that are not happy but why kill the messenger? One would reason that Sprint is working with design engineers to build phones that will do all that we ask. Sprint's NV is not complete and will not for a while longer. Eventually all phone manufacturers will be on board with Sprint and we will have a wide variety to choose from. It will take a little more time and I, for one, am willing to wait. Would an october 2nd release sound too early? Read somewhere about they are expecting it then. cool, i cant wait to not buy it. 349... is world phone and no tri-band worth 50 dollars more than everyone else??? ...in practice, what does lack of tri-band mean for a user, say, in Chicago? No, not 100 percent my opinion. I drew consensus from multiple opinions, including those of well known, respected tech writers. So, try again.